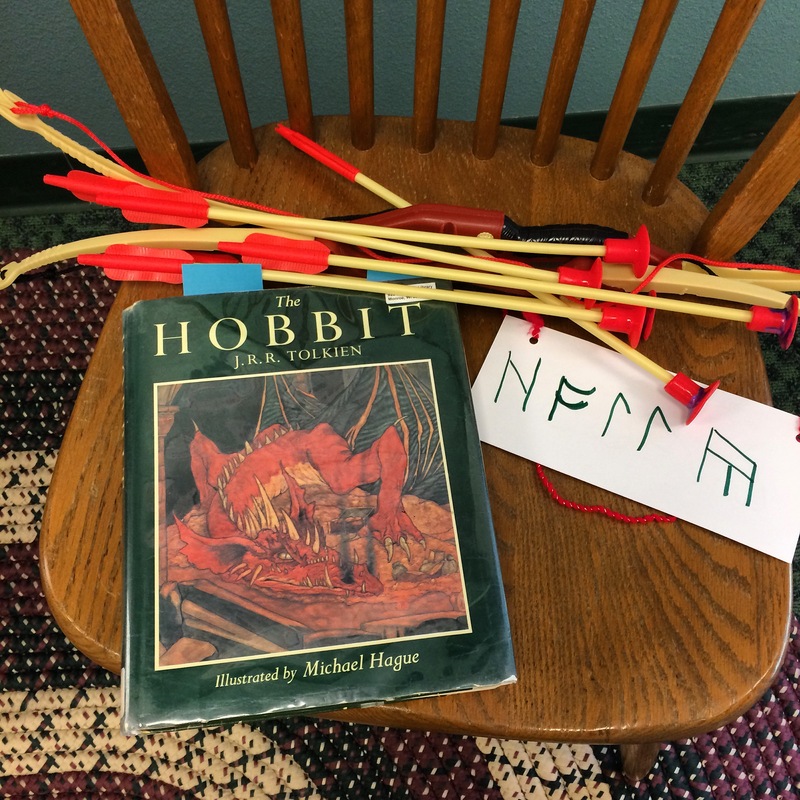 One of my older homeschool students requested a LOTR program, so I tweaked that a little and decided on a Hobbit theme so that younger students could enjoy the books too. I started by asking who had read The Hobbit, and about half the kids had either read or listened to it, and one kid had just started reading, so I had to promise we wouldn’t spoil the ending too much. Which we kind of did. Oh well. I asked the kids who had read it to tell the rest of the group about hobbits, and we talked a lot about the characteristics of a hobbit (they have furry feet. they like food. they do NOT like adventures) and about some of the other characters in the book. Then, I read the opening of the book, summarized how Bilbo got involved in the adventure, and then I read the riddle scene. We paused after each riddle, and the kids got to guess; they came up with some pretty creative answers! After our storytime, we moved on to stations! 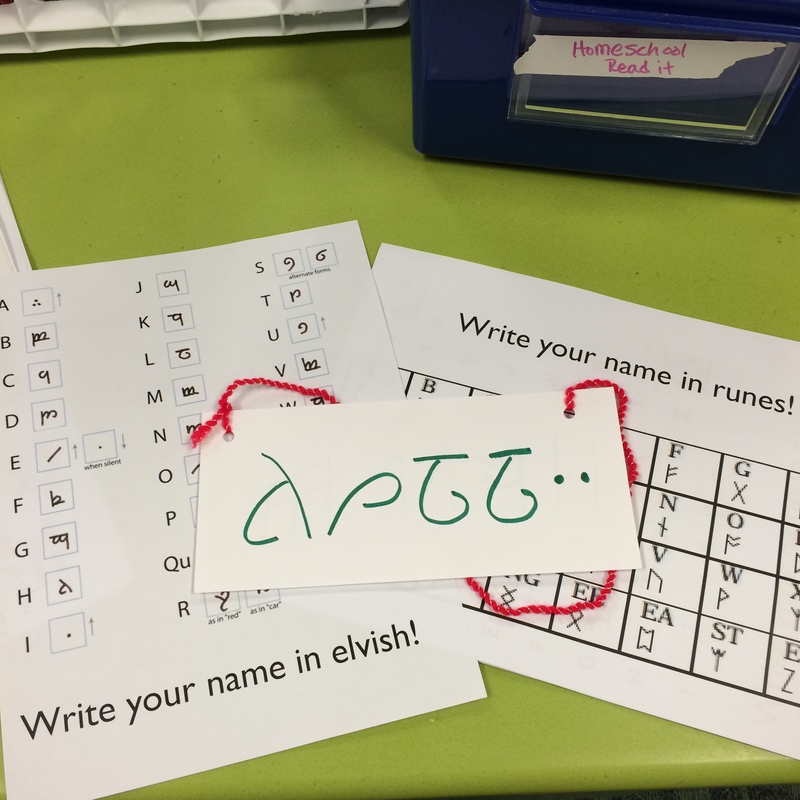 Name tags: I had both elvish and rune alphabets, and the kids made necklace name tags with their names written in both languages. They really liked this, and took the alphabet sheets home with them to keep practicing. Make a dragon: I put out dragon coloring sheets for the younger kids, and the older ones made a collage dragon out of tissue paper. This had been a requested station, and some of my kids really get into the collaborative art projects. 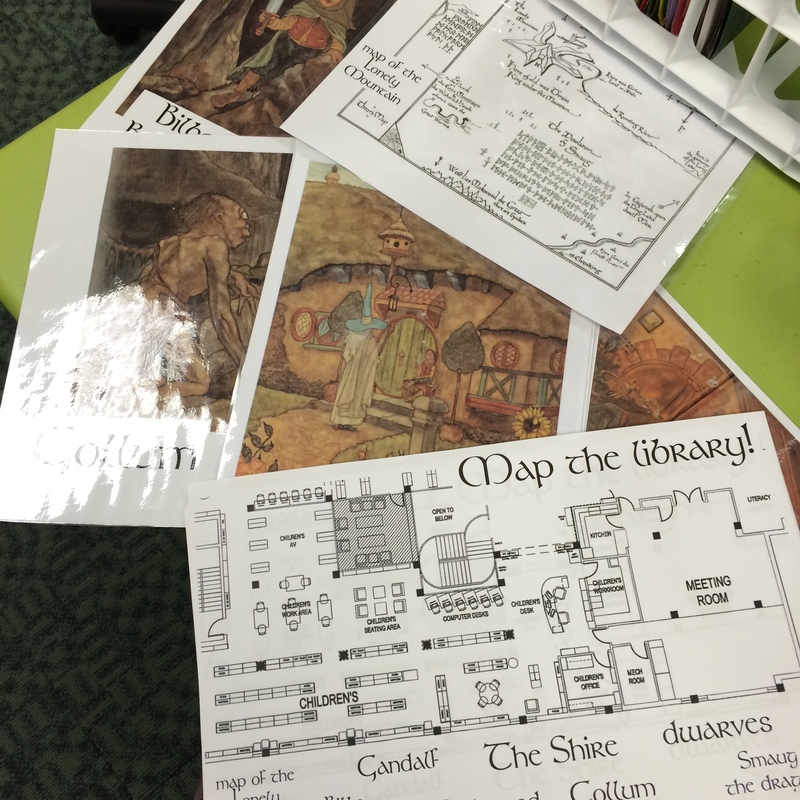 Hobbit map scavenger hunt: I hid laminated images from this illustrated version of the hobbit around our children’s room. Then, I made a map of the library (aka, our floor plan cropped to include just the children’s room) and had the kids search for each image and mark it on the map in the correct spot! A note on scavenger hunts: Kids LOVE these. I have been doing variations of a scavenger hunt for a lot of my homeschool programs, with different themes, and the NEVER grow tired of it. The kids love working together, they love helping the kids who don’t find everything as quickly, and they really love telling me about how they worked together and helped their friends. Seriously, could it get any better? Now this is an easy go-to station idea! Shoot Smaug! I was SO excited about this station. 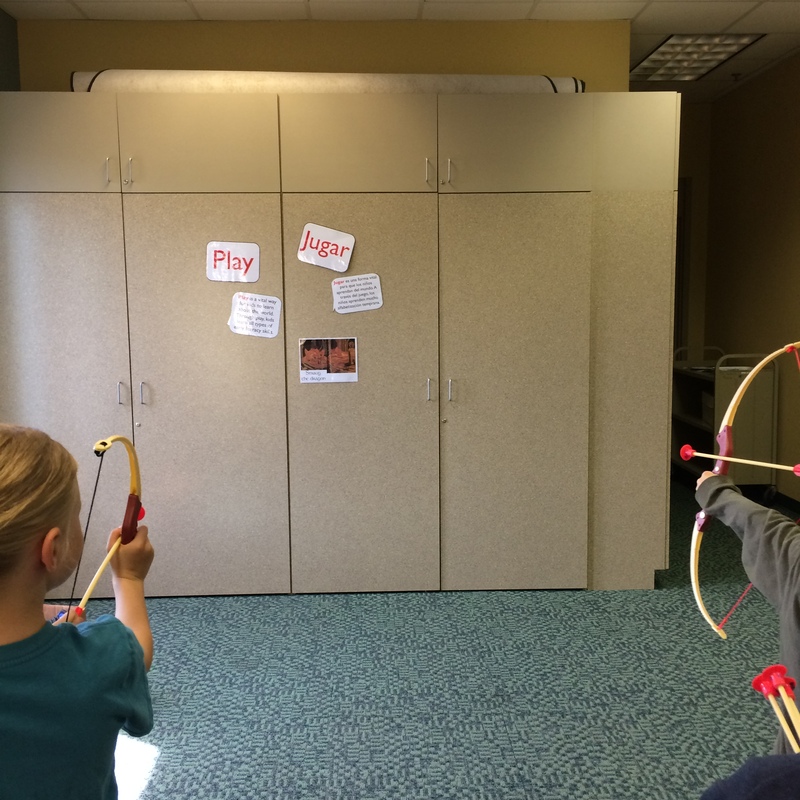 I got two plastic bow and arrow sets, stuck up an illustration of Smaug on the cabinets in our program room, and explained to the kids that we had to shoot the dragon! Well, they still had fun, and they got the hang of it, but it turns out that almost half the kids actually do archery as a hobby! They explained in great detail what was wrong with my bows, and we all learned a lot about archery and different types of bows. They had fun sharing stories and figuring out how to get our arrows to stick. We had a couple really enthusiastic shooters and lost one arrow to the top of the cupboards. What a fun program! Where did you get your bow and arrow sets? Thanks! I got these at Walmart, they were just a generic set.